Panoramic view of Augustus Hawkins park. 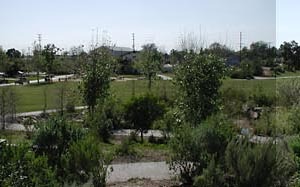 The Augustus F. Hawkins Natural Park is widely touted as an urban greening success story. For almost a century, the site, at the corner of Slauson and Compton Avenues in a heavily industrialized corridor, was a DWP pipe storage yard. A coalition of local government and the Santa Monica Mountains Conservancy, and significant input from the surrounding community resulted in this “naturalized” environment. The main lawn of the park is surrounded by small hills covered in native scrub, with paved paths offset by dirt trails. A mountain stream-in-miniature begins at a wind-powered spillway at the top of one hill and trickles down through a rocky watercourse shaded by trees. Hawkins Natural Park is a scaled down version of the Santa Monica Mountains, and indeed, the public programming at the park reinforces that at every opportunity. The Mountains Recreation and Conservation Authority (MRCA, a subsidiary of the SMMC) is the park’s steward, and provides free buses on the weekends to take resident children to the Santa Monica Mountains. On site, the park hosts a Junior Ranger program and a visitor center (after all, what’s a state park without one) which contains exhibits about wilderness rather than urban wildlife. Blue Line to Slauson; walk three blocks west to the park. Or, 110 to Slauson exit, head east on Slauson. There is parking inside the park gates.